Typhoon® Tungsten Carbide Burs feature unique structurally aligned tungsten carbide points that are long lasting and do not load up quickly with material. The fine grits are for general shaping and sanding while the coarse grit is for more rapid and aggressive shaping and roughing-out work. 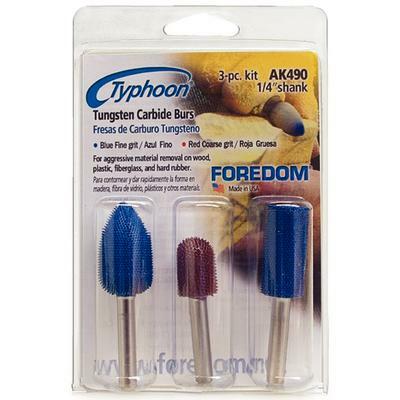 Typhoon® Tungsten Carbide Burs are ideal for use on acrylic, die stone, plaster, hard rubber and fiberglass. The Shank Sanding Sleeves are for use on Foredom’s bench lathe as well as other bench lathes.